Kane Hodder, Tyler Man, Brian Steele and Derek Mears from Days of the Dead LA !!! Nasty Neal, Terrible Troy, Goddamn Bozarth, Duckman and Jimmy Jam recap the Days of the Dead 2013 experience. Plus we review Evil Dead and talk about some random bs !!! 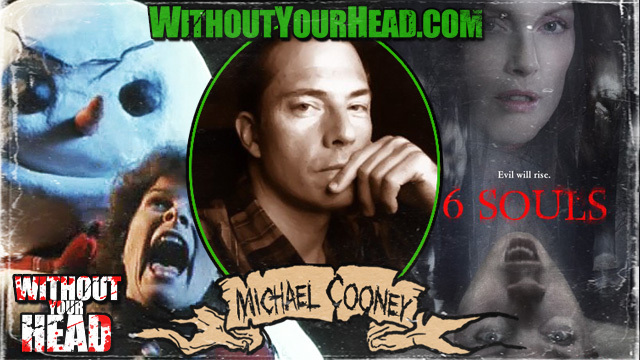 Nasty Neal sat down with Michael Cooney, writer of 6 Souls to talk about the film. Tonight 9PM EST 6PM PST Nasty Neal, Terrible Troy & Wicked Will return for Without Your Head Horror Radio. We will be recapping Days of the Dead Los Angeles, reviewing Evil Dead and much more. Plus other random madness you have come to expect from Without Your Head. Listen live, and join the interactive chat room to talk horror with the hosts and fans of the show. Jake "The Snake" Roberts interview from Mad Monster Party in Charlotte, NC. Mark Torgl "Melvin" of The Toxic Avenger interview from Mad Monster Party in Charlotte, NC. Nasty Neal and Will Bozarth recapped their Mad Monster Party experience and ran down the upcoming Days of the Dead LA !!! We will be recapping Mad Monster Party and counting down to Days of the Dead Los Angeles.